Whatever Happened to '90s Creeper Sandals With The Thick, Black, Stretchy Strap? We've talked popcorn shirts, we've talked tattoo choker necklaces, but this particular 1990's throwback comes with one hell of a personal story from yours truly. I'm talking real personal. It involves feelings. Jealousy. Inadequacy. INTRIGUE. Okay. Back in the '99/'00/'01 period of my life, I had this fantastic best friend who lived next door. Our BFF-ship was a teenage dream, full of coded boy talk, running across each other's lawns to see if the other one was home, biking down my steep driveway, and watching Spice World. But like any friendship between two females, the seeds of competition had been placed deep in our souls by society itself. And those seeds grew into something darker than either one of us could handle: WARDROBE ENVY. Clarification: I suffered from wardrobe envy. My BFF probably didn't envy my largely thrifted, slightly awkward wardrobe — I was by no means the suave Karlie Kloss lookalike I am today — but I totally wanted her cool new clothes. Limited Too hoodies, spaghetti strapped tanks, asymmetrical skirts worn with foam platform flip-flops? This girl had it all. One day, she came over to my house to see if I was done with my math homework. (I wasn't. I never was.) She didn't mention her new shoes — she didn't have to. As we made polite small talk, I couldn't stop staring at the incredible pair of sandals on her feet. They were unlike anything I'd ever seen before. I WANTED THEM. Oh, believe me, I know. This shoe has aged worse than [insert heartless celebrity reference here]'s face. But in the 1990s, this shoe was a real beauty, hovering alluringly in so many tween dreams. It was characterized by a thick, platform sole and a piece of stretchy fabric that covered the top of the foot. Today, we might think of them as a bit normcore, in honor of their simple silhouette, but back then, we thought of them as "must-haves." 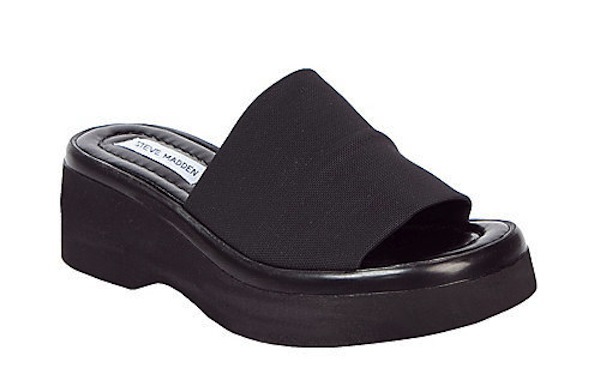 Plenty of brands produced this type of flatform/creeper/stretchy sandal, but of course, if you were really in the know, you had the Steve Madden version. You'd think that something as glam-hideous as a "flatform sandal" must have originated in the '90s, but platforms and all their chunky children have been around since ancient days. Refinery29 has a fantastic slideshow of the platform shoe throughout the ages, starting in 220 BC; weirdly enough, ancient Greece's version is actually the chicest of the bunch. Looks like civilization truly has been going downhill ever since. But don't say that to the '90s stretchy sandal-wearers of the world. To them, civilization culminated in this: A little extra height, that distinct shuffle in your walk, and the assured tween elegance that comes from wearing something the rest of society thinks is ridiculous — but you and your pals know is the last word in cool. Whatever happened to my friend and her Steve Madden stretchy sandals, you ask? The sandals went the way of all trends, but the friendship is still going strong. See, society? You can maintain a healthy relationship with a woman who has cooler shoes than you.